When I go to Greens Bush I like to drop in on Flinders back beach as well. There is a pair of resident Hooded Plovers on the beach that are surviving the conditions and the number of people that visit. It is a popular area, with the golf course above and the easy access to the beach at several points for locals and visitors. It is probably the closest point to Melbourne to find the Sooty Oystercatcher, the Hooded Plover and a good chance for the Black Faced Cormorant (though I have not seen them there yet). I visited twice on the weekend, once at high tide and again at low tide. At high tide the birds rest and groom at the high water mark waiting for the tide to turn and occasionally run into the waters edge for anything juicy that may become exposed or washed up. 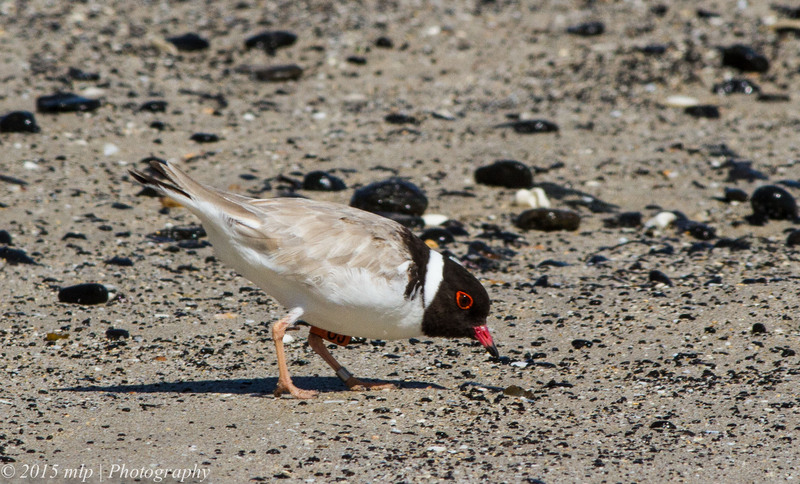 The Hooded Plover is a closely monitored bird. It is endangered in many areas along the Australian coastline due to housing and commercial development and land clearing. It is particularly vulnerable to beach users especially dog owners. It lives and hunts on the sand and nests in scrapes amongst the sea weed at the high water mark or at the base of the dunes. It is hunted by cats, foxes and other predators and the nests are often disturbed or destroyed by walkers and dogs. Some councils will rope off areas when Plovers are nesting but so far I have only seen the Mallacoota council do this at Betka Beach. (On a busy day people did seem to stay clear of the ropes and the signs.) It is too bad that other councils don’t try it as well. 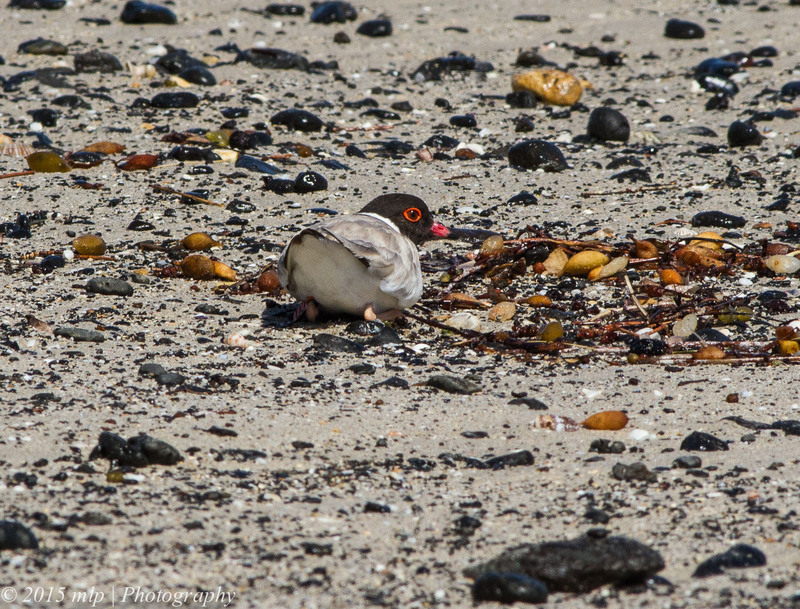 Hooded Plover II – hunkered down against the wind with plumage that helps camouflage against predators. Associating closely with the Hooded Plover was a Double Banded Plover. Due to its size I had thought it was a Juvenile Hooded Plover but I am happy to be corrected. 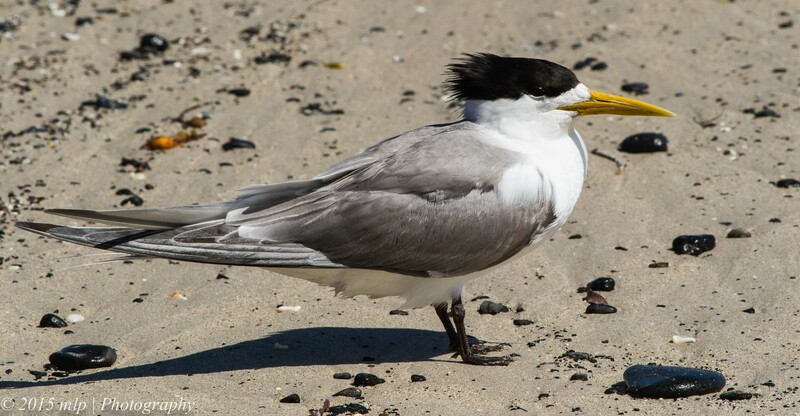 This entry was posted in Birds, Victoria and tagged Australian Birds, Bird Photography, Crested Tern, Double Banded Plover, Flinders Ocean Beach, Hooded Plover, Nature Photography, Victoria. Bookmark the permalink. The picture marked as a juvenile Hooded Plover is not a Hooded Plover. It looks like a Double Banded Plover to me. Did you by chance get the reading of the engraved orange flag on the left leg of the adult Hoodie pictured in part 2? Looks great habitat for Hoodies judging by your pictures, I will have to check it out soon. I am a volunteer on the Bass Coast and last season helped flag 10 chicks with those engraved flags, although not that many survived until they fledged. I will try to find out where and when it was banded. 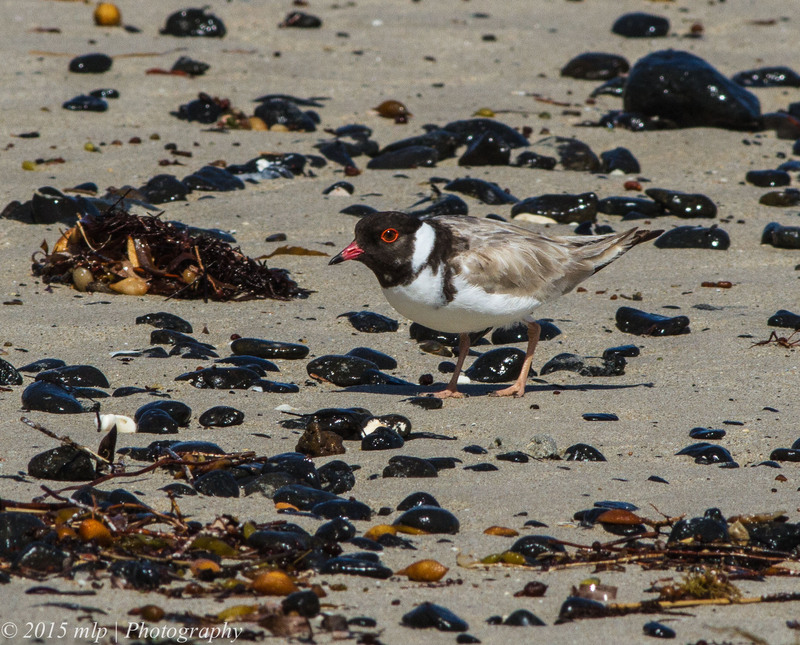 There is a portal where sightings of Hooded Plovers can be uploaded. Although I like birds overall, I am addicted to those little Hooded Plovers. After spending the last season finding and trying to protect their nests(with little luck), then you get to realise what they are up against. Some pairs on the Bass Coast had 3 and 4 attempts at breeding(9 or more eggs) over maybe a four month period, for no chicks hatched. Foxes,storm tides, people and dogs being the main culprits. I know that this pair have been at Flinders for a few years now and have bred before. They are up against it especially in the areas regularly visited by people. I have seen on a number of occasions people walking their dogs along this beach even though it is part of the National Park and dogs are not suppose to be off the lead. I will likely have a look down there soon. I was down there this week, but without my binos and scope, and saw Mushroom Reef for the first time. I would guess that birds flock there on the off season, so I might even see some of my missing Bass Coast birds there with a bit of luck. I noticed on the portal that there is only 1 entry for Flinders last season, so it can’t be monitored too often. I can see that UJ was seen then too, so it is probably its territory. I would guess that all the volunteers for the Mornington Peninsula are based on the other side(Portsea to St Andrews), and don’t get to Finders often. 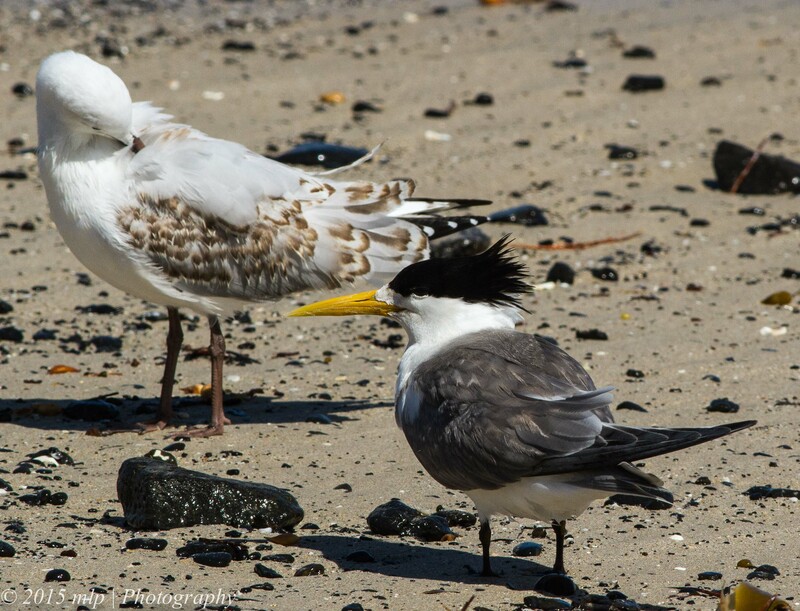 The bird at Flinders(UJ) was flagged at Harmers Haven as a 28 day old chick in April 2013. Harmers Haven is on the Bass Coast, near Wonthaggi. If you see Hooded Plovers in future, could you please email me(or if you want, you can get access to the portal where you can upload your sightings yourself). Some birds have yellow flags and others will have smaller combinations of flags on each leg. For instance….orange over metal left/orange over green right. The more info Birdlife gets the more they learn of the birds and the more can be done to try and conserve them. That bird(UJ) at Flinders is obviously setting up home there, as I went there yesterday and it was there along with a bird with no bands. Pretty sure that the volunteers on the Mornington Peninsula will try to protect any nests there if they can find them.